DriverEducators.com is the preferred choice for drivers education on the Internet and in classrooms. With over 20 years of combined experience, DriverEducators was founded in 2008 with the mission to always be a premier traffic school offering courses nationwide. DriverEducators obtained several course approvals as a satisfying traffic school providing a variety of online courses such as defensive driving, point or insurance reduction and drivers ed needs. Whether you need to dismiss a traffic ticket, obtain a new learner’s permit or driver license or receive a discount on your auto insurance, take one of our accredited and highly acclaimed driver safety education courses in Florida, New York, Michigan, California and several other U.S. States. 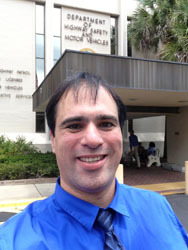 Ron Herdy has recently represented Driver Educators on the annual meeting at the headquarters of Florida Department of Highway Safety and Motor Vehicles located in Tallahassee, Florida. The meeting included a broad knowledge of various department services and also topics regarding upcoming legislation. DriverEducators.com also participates in the Florida Providers for Traffic Safety, a non-profit organization. To read more about FPTS please CLICK HERE.